Why You Should Enjoy Your Tibet Tour from Kathmandu? One of the best places from which to enter Tibet is Kathmandu, the capital of Nepal, China’s closest neighbor. Lying on the western border of the Tibet Autonomous Region, Nepal is the only country that has direct access to Tibet, and the only international airport that has direct flights to the Tibetan capital of Lhasa. Sharing more than just a border, Nepal and Tibet have an ancient and harmonious relationship, and traveling to Nepal to enter Tibet makes touring the region at the roof of the world much more exciting. Let’s find out why you should plan your Tibet tours from Kathmandu. Geographically speaking, Tibet and Nepal are neighbors, sharing a border along the northern edge of Nepal and the western edge of Tibet. Separated by the central Himalayas, Nepal and Tibet share more than just a border, with Mount Everest and several other high mountains lying right on the border. In fact, the border between the two runs directly across the summit of Mount Everest. From Kathmandu, there are two ways to travel to Tibet, by flight and by traveling overland. Flights from Nepal to Tibet are the only international flights permitted to land at the Lhasa Gonggar international Airport, and there are several flights per day between Kathmandu's Tribhuvan International Airport and Lhasa. The airlines that run the flights are Chinese-based, and include Air China, Tibet Airlines, and Sichuan Airlines. On average, the flights cost around 400 US dollars each way, although this can be cheaper in the low season months for Tibetan tourism. Traveling overland to Lhasa from Kathmandu is a popular choice for travelers entering Tibet from Nepal, and is an awesome adventure of epic proportions. From Kathmandu, you travel by bus to the border at Rasuwa Gadhi, which is an adventure in itself with the roads and traffic in Nepal! Once across the Resuo Bridge over the Trishuli River Gorge, you enter Tibet and Gyirong Port, the immigration site for international tourists. You will be met by your guide and driver, and begin your tour of Tibet, running backwards from the normal tours and traveling across the entire plateau to end in Lhasa. Both Nepal and Tibet have strong ties to Buddhism, and Siddhartha Gautama, the first Buddha and founder of Buddhism, was born in Lumbini in western Nepal. For more than 2,500 years, Buddhism has been practiced in Nepal, China, and parts of India, and was first introduced to the Tibetan plateau in the 7th century. Originating in India sometime around the 6th to 4th centuries BC, where Gautama Buddha mostly traveled after his enlightenment, Buddhism in Nepal and Tibet has developed into its own unique forms, and Tibetan Buddhism has further branched into four different schools. 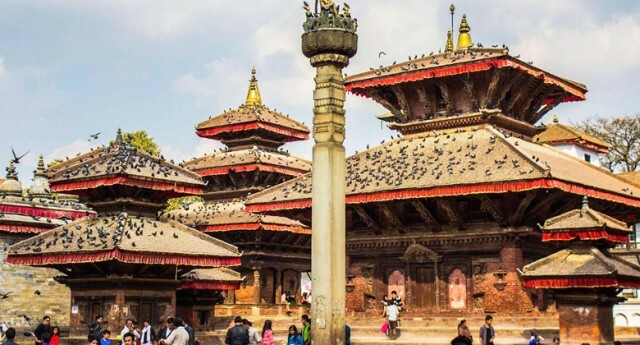 Originally an Indian religion, Buddhism practices have been used in Nepal and Tibet for thousands of years, and while Nepal is mainly a Hindu nation, Buddhism and its rituals are commonly found throughout the country. Nepali Hinduism and Buddhism share many of each other’s ceremonial rituals and beliefs, which have given both religions unique forms in the country. Hindu temples stand next to Buddhist stupas and shrines, and celebrations and festivals are often attended by both Buddhist and Hindu in both religions. The Buddhist traditions of Tibet, while mostly introduced under the reign of the Tibetan king, Songtsen Gampo, originate from Indian scriptures that were translated in to Tibetan. During the period, famous Buddhist masters such as Padmasambhava and Śāntarakṣita, were invited to visit Tibet to teach Buddhism to the court and were largely responsible for founding the first schools of Buddhism in Tibet. After the decline and rise of Buddhism in Tibet in later centuries, there was a lot of influence from Nepal, mostly in the form of architectural styles and rituals, which were passed along through interaction with the Nepali traders and monks that crossed into Tibet. Buddhist traditions still prevail in parts of northern Nepal and throughout the entire Tibetan region, and are devoutly followed by all Tibetans. Tibetan Buddhism is a major part of Tibetan culture, and the acts of devotion in Tibetan Buddhism feature heavily in their daily tasks and lives. Traveling from the Kathmandu Valley, the location of Nepal’s most sacred Buddhist sites, to the Tibetan plateau, you can see evidence of this devout religious fervor in both the people and the landscape, which in Tibetan Buddhism is also sacred. One of the greatest sights in both Nepal and Tibet is the view of the world’s highest mountain, Mount Everest. One of the most popular tourist locations in the world, visitors from around the globe travel to Nepal and Tibet to get a view of this massive peak in all its glory. Lying right on the border of Nepal and Tibet, visitors have the choice of viewing it from the north in Tibet or from the south in Nepal. And while the two Base Camps are very different in most ways, they are both amazing sites to visit. In the south, the base camp lies at an altitude of 5,364 meters above sea level, and is one of the most popular treks in the world. Taking nine days to travel on foot to the base camp, it should be noted that the summit cannot actually be seen from there. 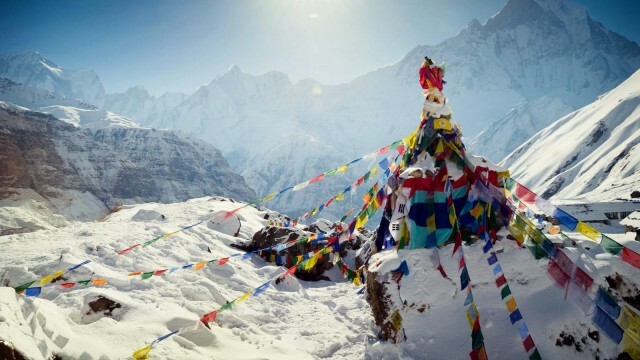 In order to view the peak, and get those awesome photos, trekkers must go higher, to a ridge known as Kala Patthar, to get a view of the peak and take their photos. At 5,545 meters, Kala Patthar is one of the highest points of trekking in Nepal, and is much higher than the base camp, giving an excellent view of the summit and the famous southwest ridge, over which the expedition to the summit traveled. In the north, the base camp is much more easily accessed, as you can travel by car almost the whole way to the camp itself. More permits may be required for the trip to Everest Base Camp (EBC) in Tibet, but it is easier to get to, with paved roads running from Lhasa to just before the base camp, at Rongbuk Monastery. The final stretch, however, does not require any trekking, though you can walk the few kilometers to the basecamp if you wish, to get a better experience of seeing the looming mountain getting ever closer. The northern base camp is also the perfect place to get some of the best shots of the summit in the world, as it is clearly visible. In fact, you can see the peak standing tall above the surrounding mountains for miles before you even get to Rongbuk Monastery. 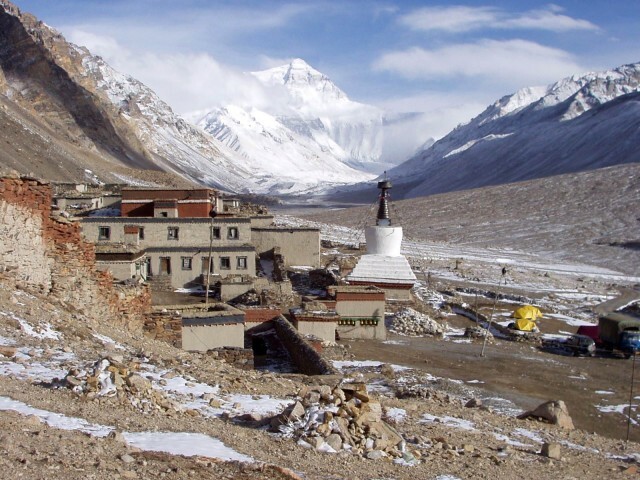 At an altitude of 5,200 meters, the “tourist” base camp lies around half way between Rongbuk Monastery and the actual “climbers base camp”, which lies at the foot of the Rongbuk Glacier on the slopes of Mount Everest. 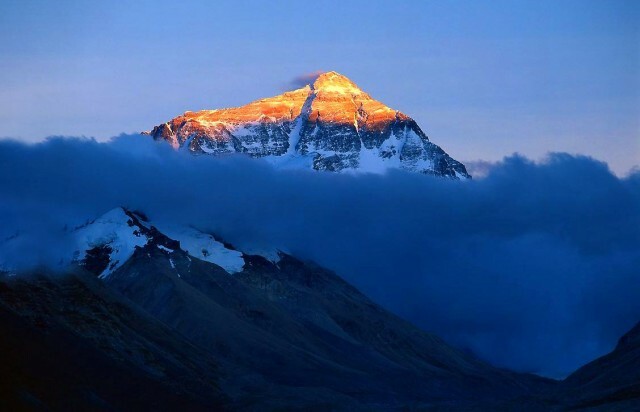 While the base camp in Nepal is the actual climbers base camp, in Tibet, due to the huge volume of tourists, the base camp that can be visited has been set back a little, to allow for the tent guesthouses and other local setups that have become part and parcel of the visit. Mount Everest is not the only sight in the Himalayas. For one of the best panoramic views of the Himalayas, the route to EBC in Tibet stops at a place called Gawu La Pass (5198m), where you can enjoy some of the world’s highest mountains that are all more than 8,000 meters high, such as Makalu (8463m), Lhotse(8516m), Mt. Everest (8844.43m) and Cho Oyu (8201m). It will definitely one of your lifetime experiences to be remembered. Whichever way you decide to travel to Lhasa, you will need the same documents before you enter Tibet. Despite flying into Lhasa and not actually touching the ground until you get to the, all the documents you need to travel outside Lhasa and in the area of the Sino-Nepal border are still required before you can board the flight. All tourists need to be on a pre-booked tour to Tibet, and once your tour is booked, we will make the applications for the permits and passes that you will need. 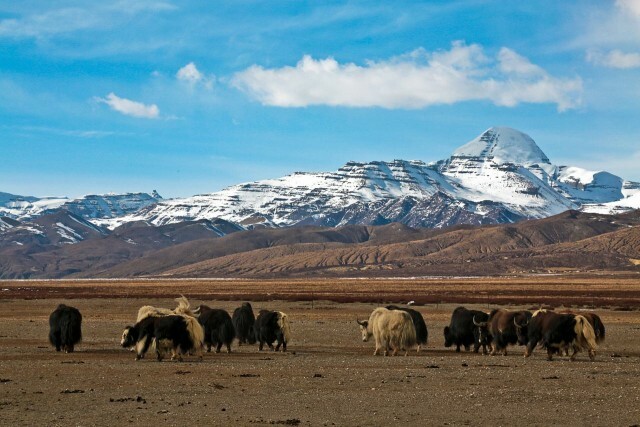 The Tibet Travel Permit (the main permit to enter and travel in Tibet) and the Restricted Areas permit (used if you are traveling to military restricted areas such as Mount Kailash) require around 15-20 days to process, so it is advisable to book well in advance. The other permits, the Alien’s travel Permit and the Frontier Pass, can be obtained easily in Lhasa and dispatched to Kathmandu ready for your trip. The final document you need is the visa. A standard Chinese Entry Visa is not valid for entering from Nepal, and the immigration office in the Chinese Embassy in Kathmandu issues a group Tourist Visa for all travelers to Tibet from Kathmandu, once you get to Nepal. Our agent will meet you to get your passport and make the application on your behalf, as personal applications are not permitted. Processing normally takes just three working days, so you should be in Nepal at least five working days before your trip.